Has a great bearing for sleepers. Made in Twin Falls Idaho. Very narrow gap and yo-yo halves. Strictly a novelty yo-yo. Came with extra spacer rings and different colored strings. Looks similar to Custom Yo-Yo's MAG 5-star. Also, came with a small aluminum stand. 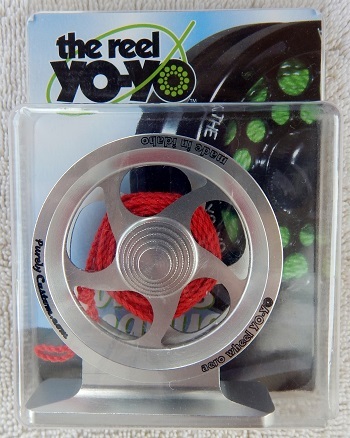 As of August 2015, this yo-yo and other designs were still available at purelycustom.com. Update: sometime in mid 2016 purelycustom.com stopped making and selling their own line of yo-yos.